“Never stop learning,” is one of my mottos that drive who I am. Being in the digital world there’s always a new thing to learn. That’s why I love it so much that I’ve fallen into a profession that’ll get me to do just that. Sometimes though, no matter how much of an autodidact I’ve been, I still doubt how much knowledge I actually have. Plus I like to be secure in thinking I know just a bit more. (I know, I’m such a geek.) I also use learning opportunities to check what I’ve learned is true. 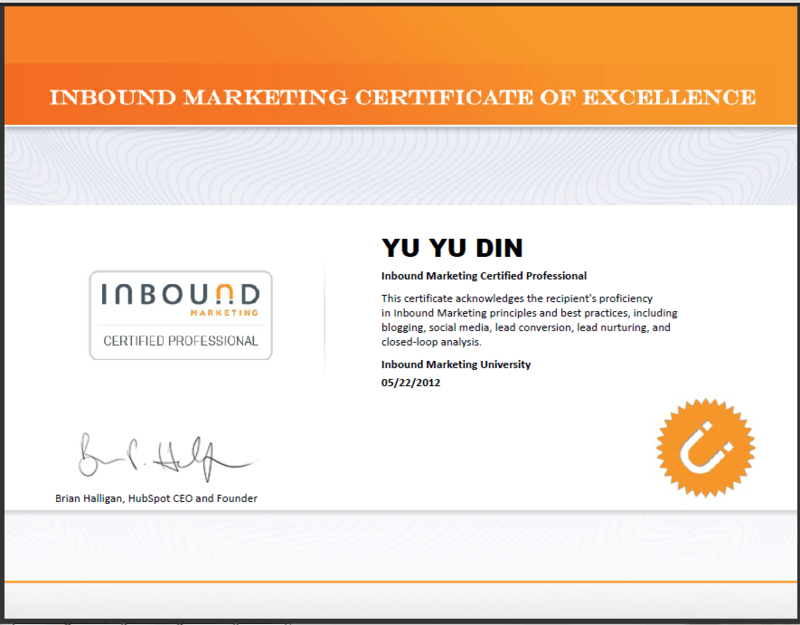 I first enrolled for the Inbound Marketing University to learn stuff that I might’ve missed out. But I didn’t get the time to study, so I skipped ahead and took the exam — partially to challenge myself. I guess I passed because today I saw that I’m certified! I’ve been really so busy since May, when I took the exam, that I totally forgot to check the Inbound Marketing University site. I went in today to check out what I can share with my junior colleagues who are in the Associate Learning Programme. Then I checked my profile – since I knew it probably needed some updating. That’s when I saw I was certified. I don’t ‘need’ it, but heck, it’s another feather in the cap and it’s another badge. I’m addicted to badges and scores. That’s also the only reason why I’m still on foursquare, and check my Klout scores. Inbound Marketing University is a great place to learn about digital marketing. It doesn’t matter whether you’re a beginner or a pro. It’s run by Hubspot – the people who wrote the book (literally!) on inbound marketing. They don’t just preach – they practice, too. I’ve been attending all sorts of webinars, reading research and downloading a bunch of templates from them for years now. Plus their marketing wisdom is never stale – they’ll give you the best advice on any new feature that comes out of any digital or social platform. If you want to develop your team’s talent, make sure you send this valuable resource – it’ll be great for those who don’t learn by searching for stuff. Tell them to get certified so you know they’ve done their ‘studying’ bit or at least you’re sure they know their stuff. Yes, I like this badge, too. What other sites have you found useful that you can learn digital stuff for free? Please do share in comments!